The daily breeze we have been having lately subsided this past weekend which really made fishing explode!!! 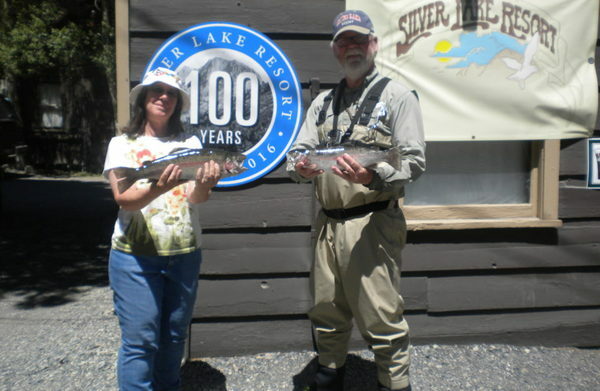 This past Friday we saw over 25 fish weighing in at or above 2 pounds caught out of Silver Lake, Rush Creek or Grant Lake. Most of those caught were dumped in this past week by Desert Springs Hatchery out of Oregon which we received a nice load of this past Monday and another good load of catchables from DFW on Tuesday. The water levels are staying really high but we are starting to see some of the creeks slowing down a little as the upper elevation snow melt is starting to diminish as the summer wears on. Water temperatures are also starting to slowly increase as we are seeing temperatures near the surface right around 53 to 55 degrees which means that the fish are going to start to go deeper into the waters to stay cool. Look to take your baits to the bottom of the lake with about a 24 to 30 inch leader. Bait fishermen have been doing really well with Berkley products like Mice Tails, Pinch Crawlers, and dough baits with Glitter and Garlic in it, and worms have seen some great results early and late in the afternoon as usual. If you like to use a lure, look to toss a Gold/Red Thomas Buoyant, Kastmasters in all colors and some Phoebes in Gold and Silver. Trolling an Olive Matuka or a Rainbow Hornberg Streamer below the surface early and late in the day have also done well. 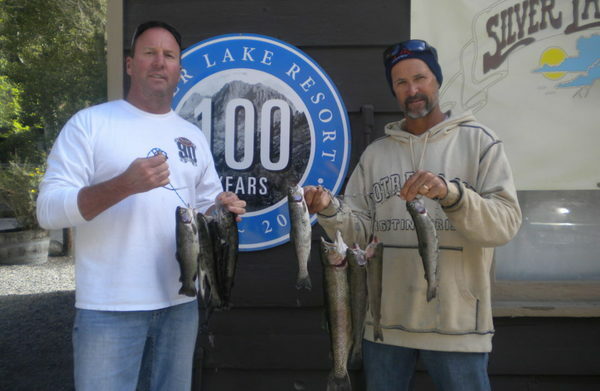 Both Rush Creek and the upper end of Grant Lake have started to produce some really nice Rainbows so look to head down canyon from Silver Lake for some additional great fishing. On Rush Creek you will have to walk it a little to find those deeper holes but they are there and Grant Lake is doing great right where Rush dumps into Grant Lake which is increasing everyday with some great water run off. 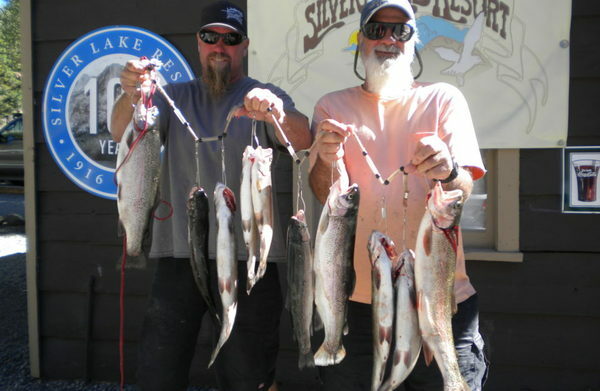 The fishing is great, the views are spectacular so don’t wait another day, come on up and enjoy all that Mono County and the June Lake Loop have to offer you!!! Young Steven Whalen was out fishing with Grandpa “Big Fish” Bob when he landed this nice 3 pound 2 ounce Rainbow caught on Silver Lake using Berkley Rainbow Glitter Garlic. The story goes that our ever famous “Big Fish” Bob was skunked and Steven not only caught this nice 3 pounder but also several other very nice Rainbows while Grandpa didn’t catch a thing. Way to keep Grandpa grounded Steven and great fishing!!! !